Some hoped this new version would rectify all the flaws of the theatrical cut. It doesn’t do that, but it does help a little, particularly with some of the subplots where the theatrical version had bits of them, but where they either petered out or didn’t make a whole lot of sense. It does add a couple of extra problems though. The film kicks off at the end of Man Of Steel. Superman (Henry Cavill) is fighting Zod and destroying a whole lot of buildings in the process. We’re not focused on them this time though. Instead we’re following Bruce Wayne (Ben Affleck), who’s down on the streets trying to deal with the fact the destruction up above is raining down death, confusion and misery on the population. This ensures that while afterwards some are lauding Superman for his heroism and setting him up as a modern day god on earth, Bruce and his violent vigilante alter-ego Batman aren’t so sure. As a result, Batman becomes increasingly certain that a power such as that possessed by Superman is too dangerous to be allowed to be left unchecked. He’s not the only one who thinks that way either, as even the government starts investigating Superman. After all, who says Superman will always do the right thing, or that his unilateral actions won’t have unintended consequences? It’s a feeling young industrialist Lex Luthor (Jesse Eisenberg) shares, who’s hoping to weaponise kryptonite as a way of stopping the Man Of Steel. As Lois Lane (Amy Adams) investigates a Civil War in Nairomi and the fallout from Superman rescuing her there, she becomes increasingly convinced something darker is going on, which is pushing the two superheroes towards a battle to the death. However, there may be other super-powered beings out there who have something to say. Batman v Superman is a movie that tries to cram a hell of a lot in. For the first two hours it’s essentially a pretty grim and gritty drama, which just so happens to be about superheroes. It wears its thematic ideas loud and proud, and it certainly has some incredibly interesting ideas. Man Of Steel got a fair amount of flak for the way it casually levelled Metropolis during the climactic battle, with barely a second thought to the amount of death that must have been happening. Batman v Superman takes up that theme, trying to explore the idea of collateral damage and unintended consequences. It also has a lot of talk about gods, messiahs, the difference between what people say and what they do, and plenty of other things. Initially it looks like it might be a fascinating ride, setting up the possibility for this to be the greatest superhero movie of them all – almost a meta-movie, exploring all the things about having massive power that are normally ignored in this sort of blockbuster film, because they are difficult and morally grey. However, after a very good first 20 minutes, it starts to lose track of itself. The whole thing becomes overstuffed, with too many subplots, scene jumps that are confusing and a lack of logic at key moments – that’s particularly true with Lex Luthor, who waffles a lot to explain why he’s so down on Superman, but it makes little sense, but neither does the idea that he’s genuinely insane. Indeed, from a pure storytelling perspective there are quite a lot of lazy elements, from a reliance on coincidence, to constantly using TV programmes to fill in holes in the plot. Although the Ultimate Edition helps somewhat by making some of the subplots make more sense, there are still plenty of bits that will leave a lot of people scratching their heads. Some of these moments – most notably a much talked about nightmare sequence – seem to have been thrown in as Easter Eggs for those who know all about the world of DC Comics, but even they might be wondering whether they really have any place in this film, and everyone else will have little idea what’s happening. The tone of the movie doesn’t help either. Taking its cue from The Dark Knight films, it wants to be dark and gritty, but it takes things so far that it often just feels nasty and depressing – and the Ultimate Edition additions make it even nastier with more violence and a couple of pretty unpleasant moments. The heroes may talk a lot about what the right thing to do is, but much of the time you wonder why they bother. Batman may be clearing the streets of criminals, but he’s also vicious and is essentially an executioner. In fact, if you think about it, his problem with Batman is pretty hypocritical considering what he actually does himself on a slightly less super-powered scale. Bruce Wayne suggests at one point that people are still good, but there’s virtually no evidence of that throughout the whole movie, to the point that you start wondering whether there’s anything worth saving. When a film gets you to the point where you’re starting to think that perhaps the League Of Shadows in Batman Begins was right about destroying Gotham, and that maybe they should throw in Metropolis too, you know it’s gone too far. Oddly, while many critics threw pot-shots about the story being subsumed under a whirlwind of special effects, that’s almost the opposite of the problem. It’s not the effects that cause the issues, it’s a lack of coherent storytelling around them. Zack Snyder is one of those directors who I’m becoming increasingly convinced should only be allowed to helm action sequences, as he’s really good at those. In fact, I feel quite a lot of tent-pole films could do with two directors – one to tell the story and the other to just concentrate on the action set-pieces. The fact is, Batman v Superman is a better film when there’s fighting, explosions and a whole lot of CGI-assisted action. The film may like to ignore physics, but the action allows Snyder to shine, especially as he tones down his slightly tedious slow-mo obsession this time around. He has a real eye for incredible visuals in these set-piece sequences, and creates some truly beautiful tableau moments. A lot of the action is pretty exciting and spectacular. As much of the last hour is essentially an extended fight scene, it’s here that the film truly comes to life, especially with the appearance of Wonder Woman. Some felt these action-packed sequences undermined all the themes, but it’s the slower sections where the problem with those arose, to the point where it was never going to be able to pull them into any sort of coherent whole, no matter what it did. That is a real shame, as Batman v Superman is an attempt to tell a superhero story on a truly mythic level, taking in some exceptionally big themes and ideas. It’s just that its ambitions are bigger than its ability to hold all these things in check. What it does do pretty well though is set the stage for the Justice League universe. 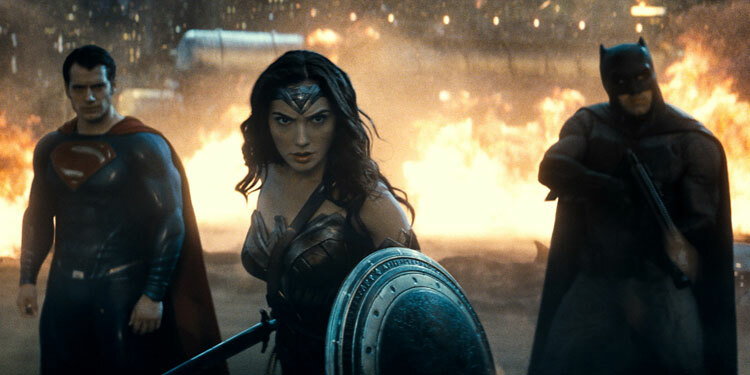 The introductions of Flash, Cyborg and Aquaman may be a little perfunctory, and while we don’t learn much about Wonder Woman, it certainly suggests she’ll be worth getting to know in her stand-alone movie next year. It also ensures there’s plenty of promise for what Justice League might offer. We should probably all have a little trepidation that Zack Snyder will once more be at the helm, but hopefully he and DC/Warner will have learned the lessons of Batman v Superman and be able to bring it all together a little better. There’s certainly a lot of good about Dawn Of Justice, and some of it is excellent and pretty fascinating, but there are just too many flaws to call it a real success. 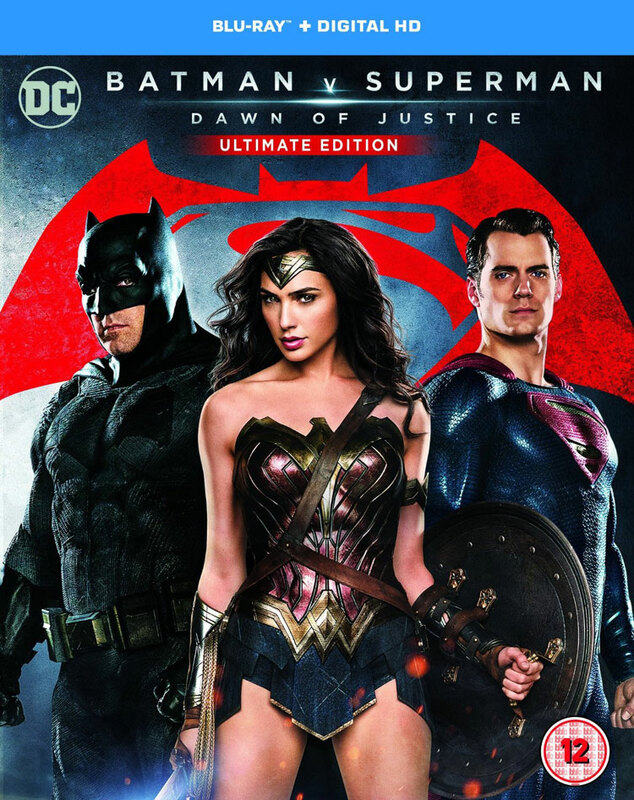 The promise for Justice League is also amped up in the Special Features, with a couple of featurettes about Wonder Woman, including an excellent one looking at her history and her impact on women’s rights over the decades, as well as about the other meta-humans. There’s also quite a few other good featurettes which add up to a very good package. I’m not sure whether I’d say the Ultimate Edition is better than the theatrical cut or not. It brings in a little more coherence to some of the plots and adds some more context to the movie’s themes. However, it also underlines some of the nastier elements and adds in a few moments that just seem unnecessary and cruel. If you liked it at the cinema, you will probably enjoy this longer version, but it’s unlikely to convince the naysayers. Overall Verdict: A brave and ambitious attempt to make a superhero movie that exists on a plane above most of what we’ve seen before. However, whether in its Theatrical or Ultimate Edition cut it can’t quite contain what it wants to do. It gets full marks for effort and it is pretty entertaining, but it’s tough not to wish that it was the film it’s trying to be rather than the one it is.